Cleaning out our memory cards this morning, we realized we hadn't run anything on the rest of the Chevy Autobots unveiled in Chicago. Hooray for me, right? 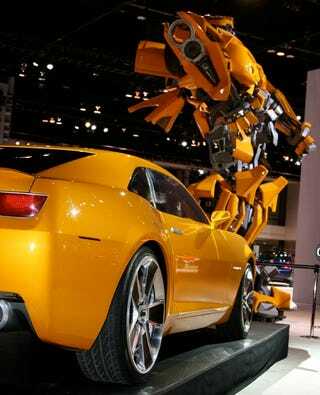 Without further ado, here's the Bumblebee "II" Camaro. Although we already showed you how Chevy put together the big Bumblebee statue, we wanted to get a chance to satisfy my robogasmic desires (destroying some of our commentariat's hopes to never see another word written about this movie) with a few shots of the new-and-slightly-more-Mad-Max-ish Bumblebee II Camaro from Transformers: Revenge Of The Fallen. Sure, we've already given you the new "Sideswipe" Stingray Corvette Concept, but no love's yet been given to one of our most valued commenters. So, voila, below are our shots of this yellow bowtied Camaro-Transformers tie-in love. Below that, we've also re-run the "How To Build Bumblebee" shots. In case you missed them.